Wolf’s Civil Engineers provide investigative and analytic services to our clients who need consulting for litigation cases involving road and roadway design issues. Because our massive network of roadways and highways is growing every year these services have become increasingly necessary. Existing roadways need to be maintained to keep conditions safe and acceptable. New roads need to be designed with the safety of the motoring public in mind. As any driver can attest, road construction is an ever-present feature of our commutes. Road building and maintenance activities need to be undertaken with careful planning to assure traffic safely flows though these potentially dangerous areas while they are being worked on, and that motorists are left with a safe road once construction is complete. We trust that our streets and highways have been designed with sound physics principals. Is this turn too sharp for the posted speed limit? Does the cross slope of that lane allow for proper drainage and provide enough lateral friction through the curve? Is this deceleration lane long enough for the car to slow down safely? Wolf engineers can help you answer these questions. The road itself is only one component of highway design, though. 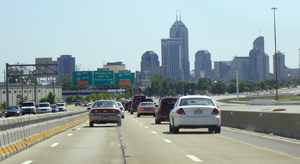 The roadside is also a critical part of a safe street or highway. An errant vehicle leaving the roadway is often faced with dangerous roadside features and obstructions. A steep drainage ditch or slope can cause a vehicle to rollover, and many rigid objects such as highway signs, bridge piers, guardrails and utility poles can present a serious danger for wayward vehicles. While it is not possible to protect motorists from every roadside danger present, care must be taken to remove the hazard, shield the hazard, or warn motorists of these hazards. Shielding these hazards also requires attentive design and planning, making sure that acceptable measures are implemented. For example, incorrectly placed or installed guardrails can sometimes create a more of a hazard than the features they are intended to shield. Motorists need information to make decisions while driving. Traffic control devices, such as signs, signals, and pavement markings, provide much of this information. These devices provide road users with warnings, regulatory information, and guidance, and should do so in a way that is clear and consistent. The Manual on Uniform Traffic Control Devices (MUTCD) is a National Standard approved by the Federal Highway Administration and provides detailed instructions on how and when to install these devices. Wolf engineers have the engineering judgement necessary to interpret these standards and assess how effectively they have been implemented in the field. The presence of construction equipment and the diversions required to perform road construction and maintenance can create unusual traffic patterns and unexpected conditions for motorists. It is crucial for engineers and builders to provide sufficient warning to road users about the hazards of road construction and how these activities may affect the roadway that users are accustomed to. Motorists should be warned well in advance of shifting and merging lanes, and the barrels and channeling devices used to isolate work areas need to be placed in a manner to provide a smooth transition and guidance in both day and night conditions. 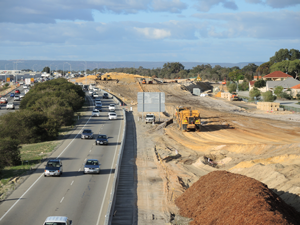 Wolf engineers can assess a construction zone traffic control layout to determine if proper measures were taken to prepare and guide road users through the affected area. Intersections are locations where there is a potential for a conflict between vehicles crossing or joining paths. According to the National Highway Traffic Safety Administration, 40% of the estimated 5,811,000 crashes in 2008 occurred at intersections. Sufficient intersection sight distance needs to be given to road users in order for them to make informed decisions and judgements about making a maneuver into or through an intersection. Obstacles such as signs, parked vehicles, utility hardware or structures, tall crops, or the layout of the terrain can all potentially limit the intersection sight distance a motorist has, thus limiting the information available and creating a potentially dangerous situation. Wolf engineers can determine how much sight distance is required at an intersection and how much is available. 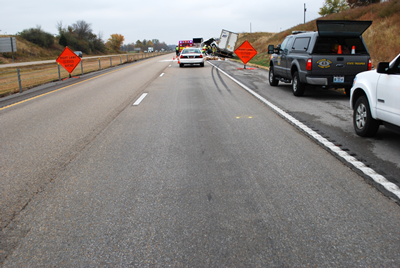 Pavement edge drop is a dangerous condition where a vertical or near vertical drop-off exists between roadway surfaces. This condition can occur between two adjacent lanes, or a lane and the shoulder. It can also occur between a paved shoulder and a surface adjacent to the paved shoulder. Paving projects can create edge drops, with one lane being left higher than an adjacent lane. 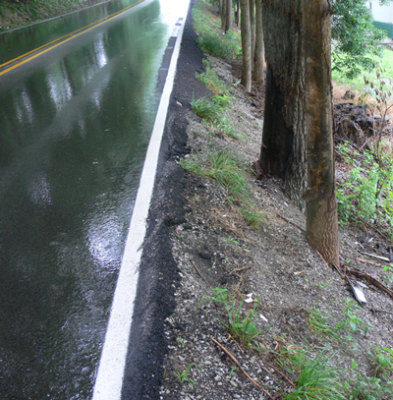 Edge drop can also occur between a lane and a shoulder when the shoulder is excessively worn or eroded, or when the lane is repaved, increasing the thickness of the pavement without also bringing the shoulder up to meet the higher edge of pavement. When a driver’s tires go over an edge drop and the driver attempts to steer back onto the roadway, "tire scrubbing" occurs between the inner wall of the tire and edge drop. Some drivers will attempt to compensate for this resistance by steering harder into the vertical edge. If the tire makes it back up over the edge drop and onto the pavement surface, the aggressively steered tire will cause the vehicle to yaw to the left if the vehicle has left the roadway to the right, which can result in the vehicle entering oncoming traffic or departing the roadway to the left. Wolf engineers can assess physical evidence left on vehicle tires to determine if tire scrubbing has occurred, and determine if an edge drop condition exists where an accident has happened.